No warming up in the bull pen tonight. 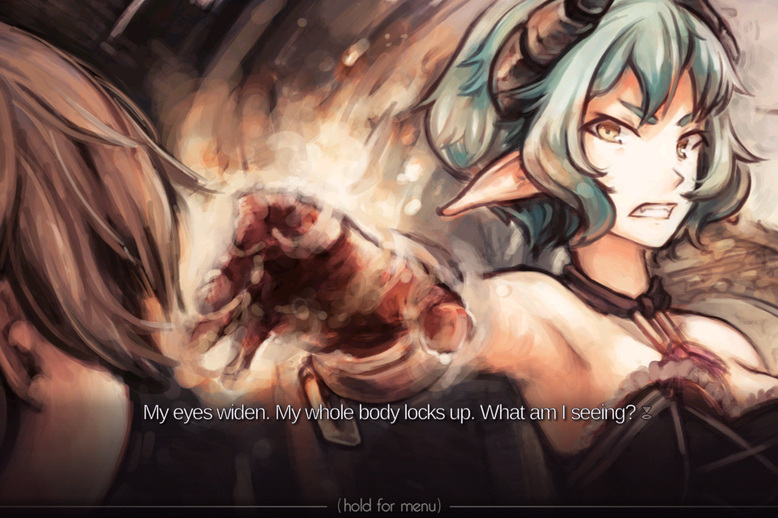 Let’s jump right into Dischan’s Kinect Novel: Juniper’s Knot. Oh and there are some slight spoilerish moments here as well so if you haven’t played the KN yet, well, get to it and then get back here. If you’re a regular of VNs Now you have seen my reporting on the up-and-coming Dischan Group. They’ve put out a fantastic teaser for their main work Cradle Song and I interviewed the brains behind the group, Dani, last year. Suffice to say, while I am excited to see what is coming for these guys I didn’t expect much out of them until Cradle Song was finished and then NaNoRenO came along. So hey: pleasant surprise! Anyway back to the actual story. From what we can tell, Juniper’s Knot takes place sometime between the 19th and 20th Century…that’s the best I can do people: don’t judge me. A boy gets lost on his way home and stumbles into the ruins of a church where he meets a demon who appears like a young girl. She seems nice upfront but the stories the boy have been told since childhood warn him against such beings, although one hasn’t been seen in generations. The audience quickly realizes that there is something to the story and the demon cannot be trusted; leading us to wonder if the boy will make it out of this grim situation with his life. Right off the bat, you realize that the story’s cast won’t grow outside of the Boy and the Girl. This means that they have to carry the entire dramatic weight of the story. While this seems simple on paper, it’s actually a pretty large literary challenge because good characters work best when they play off each other rather than issues raised by the plot. The challenge grows when you don’t get any names and one proves to be an unreliable narrator. So even attempting this particular device is noteworthy and should be commended. Do they do it right? Well, yes: for the most part. Juniper’s Knot is at its absolute best when the Boy and Girl are talking to one another. Their back and forth is not only genuinely entertaining to read, but you can track the development in their characters as well as their backstory as their conversations go on. Neither stays static for very long and the constant feeling of reconsideration on each of their parts makes it a strong story. So it’s all good news right? Well, the first third of Juniper’s Knot were a legitimately tense experience for me because the Girl was written as a credible threat to the Boy. Once that threat tempers slightly, you kind of get a sense about where things are heading. Like many EVNs this year, Juniper’s Knot is a familiar story told in the right way. Unlike most EVNs this year, the noticeable plot points and tropes are often masked to allow the readers to suspend their disbelief as they go through the story. At least until you get to the Girl. If you pay attention during Juniper’s Knot, the Girl will either make you love it or make you hate it. The story is total via first person from both the Boy’s perspective as well as the Girl’s and while we learn little about him, we do get a glimpse into why the Girl is in her current situation. Now…how do I say this tastefully? Okay let me reach back to Analogue: A Hate Story. If I didn’t make it clear in my review, Hyun-ae is insane by the time you meet her. As that story progresses, you’re not looking for the moment of catharsis that often comes cross sounding something like, ‘Dear God, what have I done?’ from her. What you are looking for is an explanation into how she’s lost her mind rather than pull her out of the depths of her madness. The Girl in Juniper’s Knot, however, is not insane. Homicidal? Yeah, but she is clear and rational enough to make the judgments and plans through the game. Which means there was a part of me wondering by the end if she deserved what she got or if she learned from her past. And the truth is I’m not completely sure that she ever did. She wanted out of her predicament, but that isn’t the same as coming to terms with how she got there which kind of makes it hard to resolve your feelings on either way. So while I loved the dramatic tension and interaction, by the time I get to the resolution I feel more conflicted than anything: like nothing was ultimately solved and the issues that the story tried to raised were merely painted over in favor of what you will get. And by God those issues. While the characters are well done the overall themes of the KN are…interesting to say the least. A few are pretty subtly handled and are almost artful in how they are studied and resolved. Others, on the other hand, take a sledgehammer to your head until you eventually scream Uncle. People judging others for ‘insert prejudiced reason here’ is evil: I get it. Not everything in the world is like you were told as a kid: gotcha. Now please stop dropping this on me because I want to enjoy the story. Bottom line: Juniper’s Knot is drama done right for the most part. Along with the characters there is a strong since of both pacing and symbolism that gives it a dramatic weight most other EVNs would give their back teeth for. While it is far from perfect, I’d immediately recommend anyone looking into character-driven or dramatic fiction writing to play through. Another great place for many to take notes would be in the Presentation because this is one of the best looking EVNs out there. Yes, it’s right up there next to Cinders as far as I’m concerned but while Moacube delivered on a colorful, storybook feel to its masterwork Dischan went with, for lack of a better word, a cinematic approach. Everything runs together in a crisp, somber combination of muted watercolors and atmospheric sounds that serve as the perfect backdrop for this particular type of story. I particularly liked how the Event CGs and the normal sprites and background often flowed into each other without much pause. Well done on that one as it allows the readers to immerse themselves fully into the story. This was an excellent job by everyone involved in the art and sound that makes Juniper’s Knot a visual treat and an absolute must see for anyone seriously thinking of making an EVN. As for gameplay, well it’s a Kinetic Novel my friends: there is no gameplay. You just click and watch it unfold without your input. There is one thing to note though: there is no real textbox here. Dialogue is done thanks to a colored pointer rather than the stock box-type user interface most EVNs utilize. It took a minute to adjust, but once I did it was a nice change of pace. 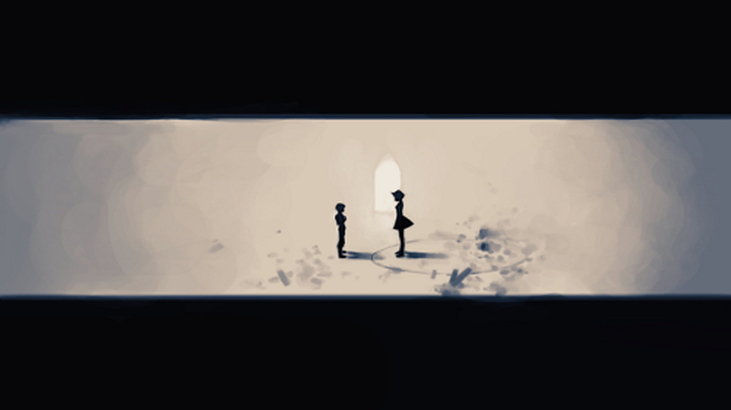 Like all NaNoRenO entries, this one is short: actually shorter than most. You’ll be done with it within an hour of downloading. However, I think once you’ve gone through it you’ll want to read it again a few more times. Juniper’s Knot is a good drama story whose characters will keep you fully invested from beginning to finish. Tied in with a brilliant presentation and the only real issue keeping it from bursting through the glass ceiling is ultimately closing the fictional deal. Everytime I read Juniper’s Knot not completely sure how to feel about its resolution. Not because the story was designed in such a way (like, you know, a top still spinning on a table) but rather because I felt some of the back story elements just felt short. It isn’t enough in a drama for me to want to see someone escape a problem or overcome some adversity: I need to know why I should want that for them. And the honest truth is that the ‘why’ never really clicked like I think Dischan hoped it would. But should that stop you from playing it? Absolutely not. Like Ristorante Amore, if you haven’t played Juniper’s Knot yet you have seriously denied yourself something interesting. It is well worth the attention it has gotten and I have no doubt we are in for even better works from the team at Dischan.